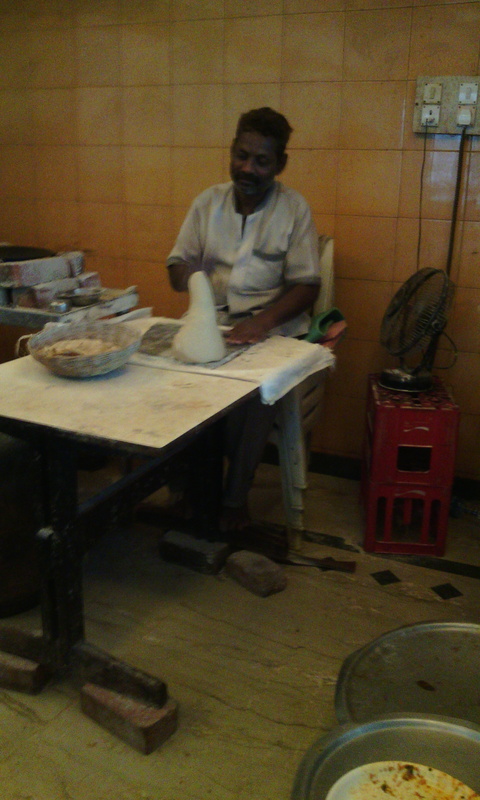 The cook with the lump of kneaded dough for Bhakri. We are back on our road trip this time it is on the Uttara Kannada belt. In our brand new Tata Zest XTA. The trip was essentially from Dharwad to Sirsi to Manipal. From there we were to travel to Kollur and back to Goa. This time round we found something called Kamat executive Inn, expecting the normal north Indian south Indian stuff we walked in. Surprisingly for us, he had only Thali’s the north Indian Thali, the south Indian Thali. And in the south Indian Thali there was the Bhakri one and the standard fare. The Bhakri’s were served absolutely fresh the cook tapped the Bhakhri right in front of us and served it right off the skillet. My husband and I of course opted for the Bhakri while my daughters seem to prefer the south Indian Thali. The accompanying dishes with the three thali’s were totally different and each authentically ethnic of the genre it was labelled. Do excuse me, I cannot share the picture of the Thali simply because I forgot to photograph it. I was so fascinated with the Bhakri making, I should have actually recorded it, and will share it the moment I can convert the file . The ambience at the Inn is rather sad and tired, nothing fancy, but the food is definitely good, though I would not say finger licking. On a scale of 1to 5 I would rate it a 2.75. Previous PostPrevious A little light on Deepavali.